The Dutch Pavilion Masterly has become the starting point of the Salone del Mobile in just a few years’ time. 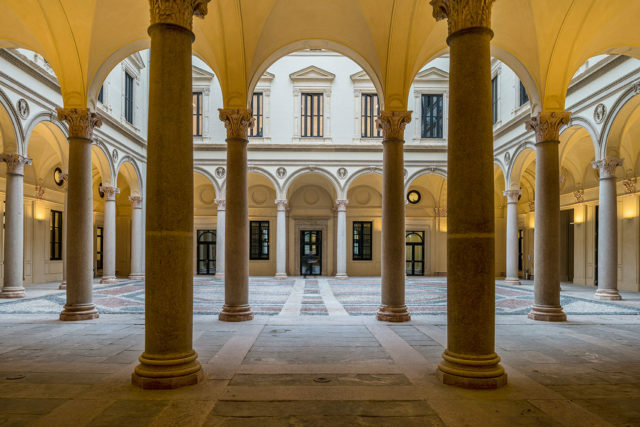 The courtyard of the Palazzo Francesco Turati will again be the beating heart for a limited period. The Dutch brand Borek will create an inviting space for participants and visitors to mix and mingle. Surrounded by a sea of colour with 15.000 tulips the haute couture of furniture dresses up the palatial courtyard. The outdoor furniture is scattered all over the world, but this is the first time for the Dutch company Borek to present itself in Milan. And it makes an entrance with grandeur and volume. With high quality, sustainable, innovative, artisan made and of course also comfortable outdoor furniture, Borek transforms the courtyard into a relaxing oasis where visitors of the Salone del Mobile are greeted with a warm welcome. Like one big Italian family everyone can join at the long tables, enjoy a drink or something to eat, work or network, while Italian chefs serve their dishes. Visitors can take a seat on chairs that are just as colourful as the tulips surrounding them and have their cappuccino’s served by the Italian baristas. This is how a neo Renaissance Palace is turned into a Dutch Design paradise. Frank Bogaers, owner of this family business of over 40 years, carefully selected the outdoor furniture for this. The tables in the so called high dining restaurant area of the courtyard, have been crafted in artisan fashion from high quality, coated aluminium. Stackable chairs, named Sineu, accompany the dining tables. Objects that could immediately pass for the ideal, modern Italian terrace chair. A powder coated, galvanised steel frame holds a seat in exotic shades such as fuchsia, Turkish tile and navy. The seats are handwoven from Ardenza Rope, a thermoplastic synthetic yarn. Invented by Borek. Borek has divided the restaurant area from the low dining space by means of a path, with tulip borders on each side. On the low outdoor lounge furniture from the Lincoln collection you can relax comfortably. Well known stylist and designer Eric Kuster designed these natural looking grey and sand relax benches, taking you to tropical destinations. Then there are the soft handwoven Crochet-poufs of Ardenza Rope and the indestructible tables by Dekton that look like natural stone, but consist of an extraordinary combination of materials: quartz, porcelain and glass. Of each of the seven renowned Dutch Designers who collaborate with Borek on this extensive collection, Frank Bogaers shows a showstopper. This can be a lounge bed, pouf or arm chair. Not just the outdoor furniture, but also the designers themselves – Marcel Wolterink, Eric Kuster, Remy Meijers, Bertram Beerbaum, Frans van Rens, Maarten Olden and the most recent addition, designer Hugo de Ruiter – are present at Masterly. Max & Luuk on the roof top terrace. Another collection of indestructible garden furniture that withstands both the Dutch wind and weather and the Milanese sun, is the characteristic collection Max & Luuk, named after Franks Bogaers’ two sons. With a broad view on Milan and the nearby Duomo, the roof top terrace is the ideal location to enjoy the peace, quiet and the amazing view, seated on the colourful, happy and trendy furniture from this young collection. From courtyard to roof top terrace, with Borek, Max & Luuk, the Dutch Pavilion Masterly has gained a new star.